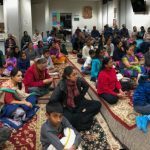 Venue: Hindu Bhavan of the Hindu society of North Carolina. 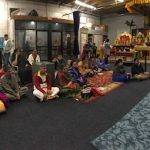 With the blessings and the divine grace of Sri Sri Muralidhara Swamiji, a satsang was conducted at the Hindu Bhavan of the Hindu society of North Carolina. About 30 people had the opportunity to listen the wonderful speech of Kum. Poornima ji, who effectively elaborated on Ramayana quoting from various scriptures of Hindu Dharma. 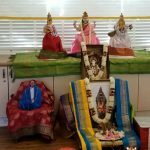 Starting with Tulsi Ramayan, Poornima ji aptly described how the Rama Nama is infact the Essence of Ramayana. She made Sri Sri Swamiji’s point loud and clear that Nama is the only path to liberation in this age of kali. to chant mahamantra 11 times daily. 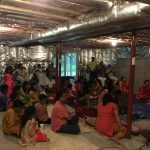 Indeed, the city of Raleigh was so blessed and so were each and everyone at the satsang.